In a medium bowl, whisk together the flour, cinnamon, nutmeg, baking powder, baking soda and salt. In the bowl of a stand mixer fitted with the paddle attachment, beat the brown sugar, oil, buttermilk, eggs and vanilla on medium high speed until smooth, 1 minute. Reduce the speed to low and add half the flour mixture, then the carrots, coconut and walnuts, then the remaining flour mixture, beating until just blended after each addition. Divide the batter evenly among the liners and bake until the tops are just dry to the touch and a toothpick inserted into the center comes out clean, 21 to 23 minutes. Transfer the pan to a wire rack and cool completely before frosting with coconut cream cheese frosting. In the bowl of a stand mixer, fitted with the paddle attachment, beat the cream cheese, butter and salt on medium speed until light and fluffy, 2 minutes. Reduce the speed to low, gradually add the confectioners’ sugar and beat until incorporated. Increase the speed to medium add the coconut and vanilla extracts, and beat until fully blended, 1 to 2 minutes, making sure not to incorporate too much air. Tint frosting with natural food coloring into pastel shades. 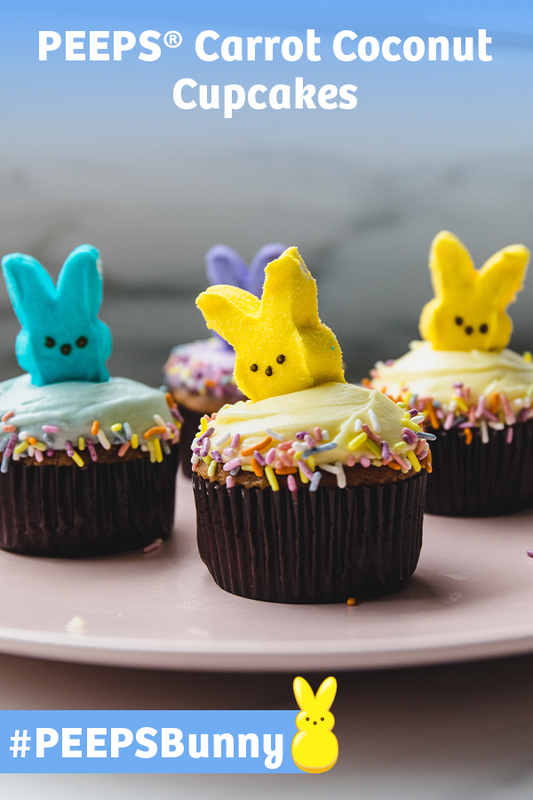 Cut PEEPS Marshmallow Bunnies in half, and place the head and ears “peeping” out of the frosting. Cover the outside of the cupcake with pastel colored sprinkles or coconut shavings.